Sri Ayyappa Polytechnic College, Cuddalore has advertised in the DINAMALAR newspaper for recruitment of Teaching Faculty- Lecturers Plus Non-Faculty jobs vacancies. 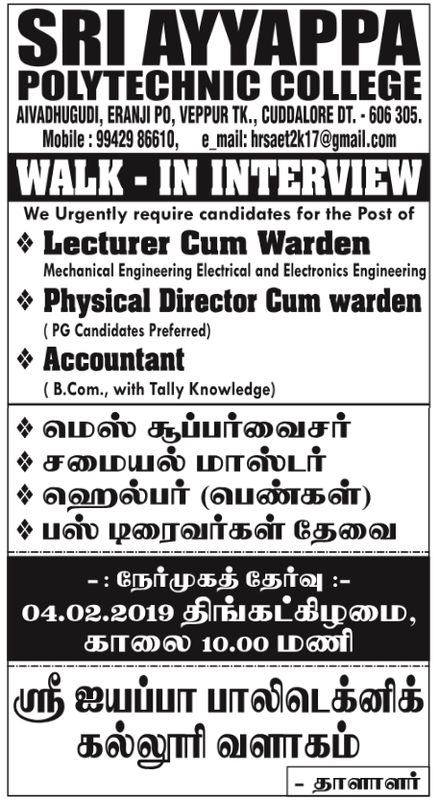 Interested and eligible job aspirants are requested to apply on or before 04th February 2019. Check out further more details below. About College: Eventhough ‘Sri Ayyappa Polytechnic College’ came into being at Tittakudi in Cuddalore district in 1997 and shifted to the present location later, it slipped into a position where only 300 students remained on its rolls in 2005. The present management took over its reins from 2005. With a sense of commitment & a burning vision, this management cared for the college. One more Polytechnic College by name “Ayyappa Polytechinic College” was established in 2008 and the total students strength has jumped to nearly 2000 now, within a span of 6 years. How to Apply: Interested and eligible candidates are requested to attend the Walk-in interview by bringing their detailed resume along with originals & copies of certificates and PP size photos to the walk-in address given below.